Eugene J. Martin (1938-2005) was a pioneering figure in the 1960s and 1970s in the transition from Abstract Expressionism to geometric, constructed and biomorphic abstraction, as well as a model for today’s loose border between abstraction and representation. His story is that of the legendary artist who sacrifices the comforts of a “normal life” in order to create. He was prepared for that hard road because his early life had not been easy. After a rough childhood as a foster child, Martin studied for two years at Corcoran School of Art and Design in Washington, D.C., where he copied the European masters. Then he moved from place to place and sometimes was homeless. Other times he lived in group homes or with friends. It was during Martin’s struggle to survive that he developed a strong signature style characterized by a molding of hard-edged geometric forms with free-flowing organic forms. In 1982, Suzanne Fredericq met Eugene Martin at the Washington, D.C. home of a mutual friend. She was pleased to meet Martin because five days earlier she had seen some of his artwork and was fascinated by them. After Fredericq completed her graduate studies in 1988, she and Martin married. Martin was finally able to work in his very first studio located in their home. In this studio, he turned out hundreds of finely-executed, acrylic paintings on canvas. A stroke in 2001 caused Martin to modify his style, but he still continued to paint. After Martin’s death, Fredericq has worked tirelessly to secure Martin’s huge body of work and giving it the recognition she feels it deserves. Her efforts include documenting Martin’s works in 16 books containing large, full-color reproductions of his works. Satirical Abstraction, the first New York showing of the long-neglected African American artist, is on view, July 21-September 30, 2013, at ASC Projects at Gallery 304, New York, NY. The solo exhibit focuses on acrylic paintings on canvas and paper from the 1990s that juxtapose soft-edged and free-flowing organic forms with hard-edged geometric structures. Martin called many of his works straddling abstraction and representation "satirical abstracts,” a leitmotif evident in graphite drawings from 1978, whimsical pen and ink drawings from 1986-1988, and a 1974-1997 mixed media heterochronic collage. 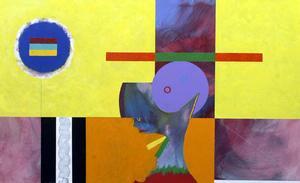 Martin was born in Washington, DC and attended the Corcoran School of Art from 1960 to 1963. In 1996 he moved to Lafayette, Louisiana, where he lived and created art until his death. Recent museum exhibitions include solo shows in 2012 at the Masur Museum of Art in Monroe, LA; the Ohr-O’Keefe Museum of Art in Biloxi, MS; and the New Orleans African American Museum in New Orleans, LA, in 2011. Works by Eugene Martin, Ed Clark and John T. Scott were included in the significant three-person “Beyond Black” exhibition at the Louisiana State University Museum of Art in Baton Rouge, LA, in 2011. Martin’s art is found in many public and private collections worldwide. These include the permanent collection of the Schomburg Center for Research in Black Culture in New York, NY; the Paul R. Jones Collection of African American Art at the University of Delaware in Newark, DE; the Sheldon Museum of Art in Lincoln, NE; the Masur Museum of Art in Monroe, LA; the Louisiana State University Museum of Art in Baton Rouge, LA; the Ogden Museum of Southern Art in New Orleans, LA; the Alexandria Museum of Art in Alexandria, LA; the Ohr-O'Keefe Museum of Art in Biloxi, MS; the Walter Anderson Museum of Art in Ocean Springs, MS; the Mobile Museum of Art in Mobile, AL; the Stowitts Museum & Library in Pacific Grove, CA; and the Munich Museum of Modern Art, among others.